As a follow up to the my previous post about Astrocamp X, it's time to put a bit more detail together on what was I managed to get out of the wonderful dark skies of Cwmdu. First true night of camp and I decided to split my time a little between astrophotography and visual. I was soon to be reminded how much time astrophotography can actually take. I wanted to make sure that I my alignment and mount set up was as good as I could get it. I decided on 2 targets for photography. 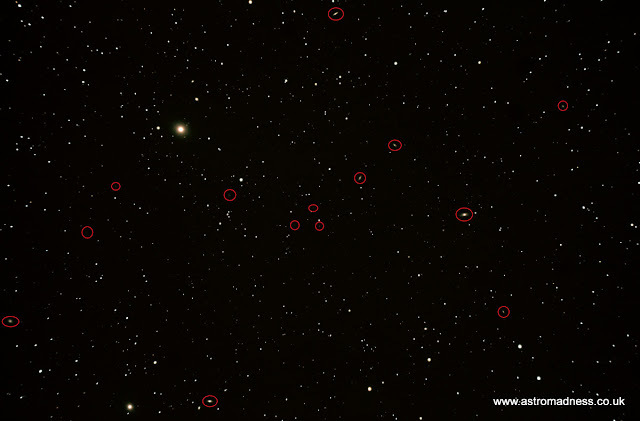 The first was an image in the Virgo cluster of galaxies. Given that I couldn't get a decent visual through the 80 ED-R, it was quite hard to establish exactly what the scope was pointing at, but I took the frames anyway and would just wait until processing to find out what I had got. Initially, I thought I had captured no significant targets and assumed that I had missed the area of Virgo I was hoping to capture. This was until I had more time after processing to really start looking more closely at the image. 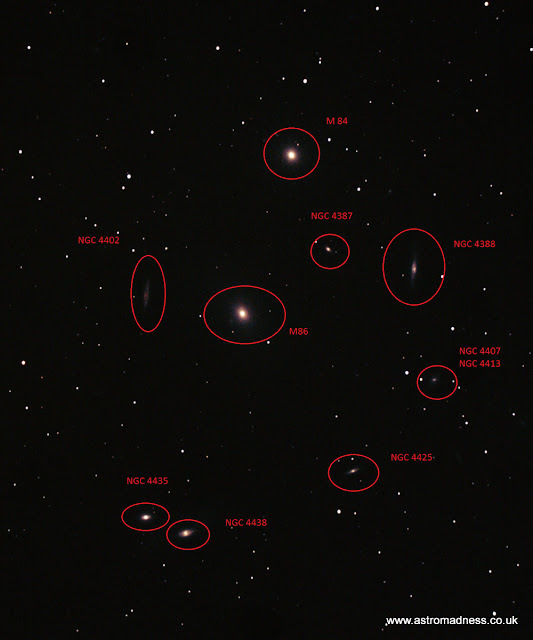 Below is the same image, but with galaxies encircled in red. For some reason although I used a focal reducer/flattener, the image does suffer a bit around the edges. During the process of the images being collected, I decided to locate myself up on the common with everyone else at camp, and use the 300p SBT to do some visual. I had compiled a list of targets that I wanted to observe. The list was quite extensive, but I only managed to observe a few things before returning to the imaging kit. Nevertheless, I did managed to tick of 3 new targets for me. Back to the imaging, and after taking the dark and bias frames, I took a look around to find the next target to image. After seeing that the galaxy cluster was going to be tricky to resolve, I decided to go for something of lower magnitude. 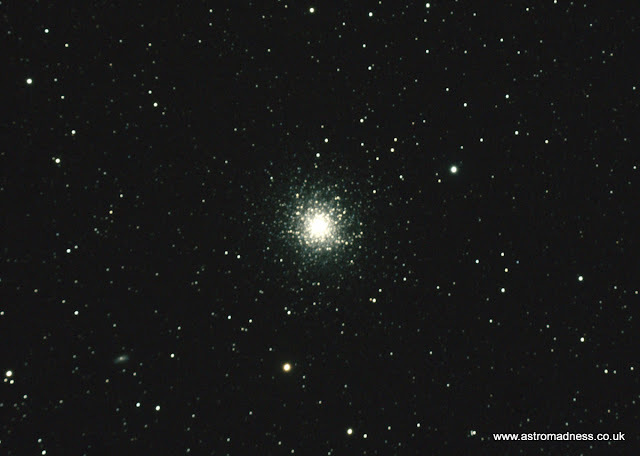 As Hercules was making it's way up into the sky, I decided on M13, the Hercules Cluster. The image was created using the same ratio, ISO values and duration of light, dark and bias frames as the Virgo cluster. The image was processed and then cropped. 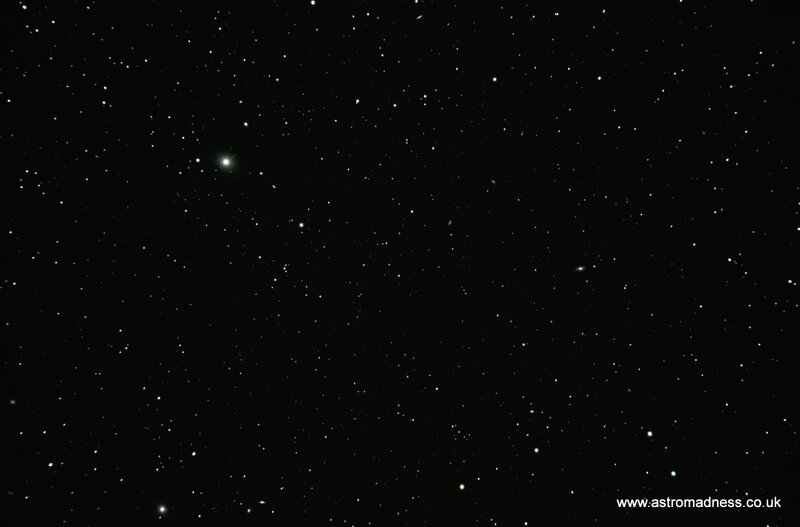 During the cropping process, I noticed that I had also captured a neighbouring galaxy. After a bit of discussion, I was initially informed that the galaxy I had captured was IC 4617, a magnitude 15 galaxy. It wasn't until I got back home and had a closer look that I realised that this was a mistake. The obvious galaxy toward the bottom left corner of the image is in fact NGC 6207. 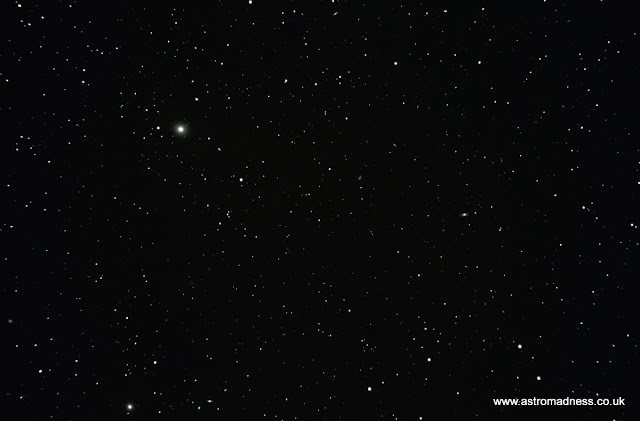 But again, the higher resolution image does actually show both galaxies. Albeit IC 4617 is very small. After the mixed results of Saturday night, I decided to concentrate solely on astrophotography on the Sunday night. Conditions were a little hit and miss with light cloud coming through the sky throughout the evening. To help identify the galaxies in this picture, the follow marks out the visible galaxies picked up by the image. At first, I was disappointed with the end result of the imaging run, but following on from the processing and identification of galaxies, I actually am quite pleased with the way in which is came out. I left camp after lunch on Monday, although I knew it was going to be a good clear night. When i arrive home, I set up everything for another set of imaging runs out the back garden. From the comfort of my own garden, and knowing that I didn't have to get up for work, I settled in for a long night. In the end, I imaged 4 different targets. 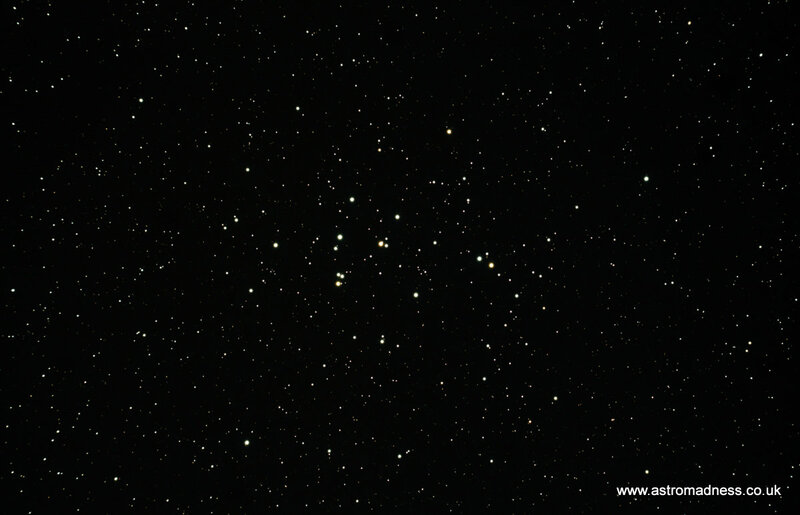 The first target was the Beehive Cluster designated M44 in the constellation of Cancer. 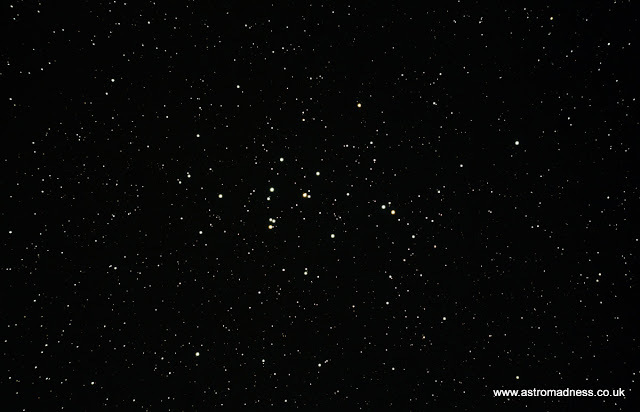 It's a reasonably bright open cluster and quite large. 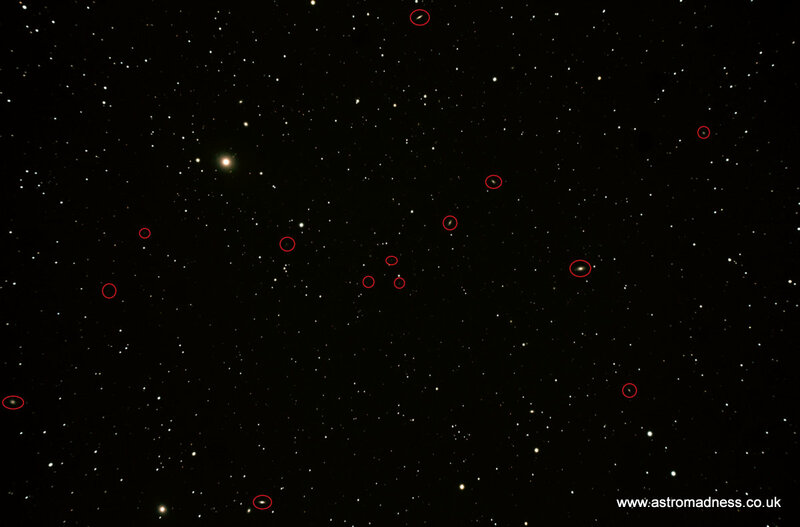 Other than the focus being marginally out, the image shows the main component stars of the cluster. On the run up to camp, I had been reading of two comets currently visible in the UK sky. During camp, fellow stargazers were intent on visually observing these two visitors to our solar system, and with some success it has to be said. I decided that I would try to image these two targets. 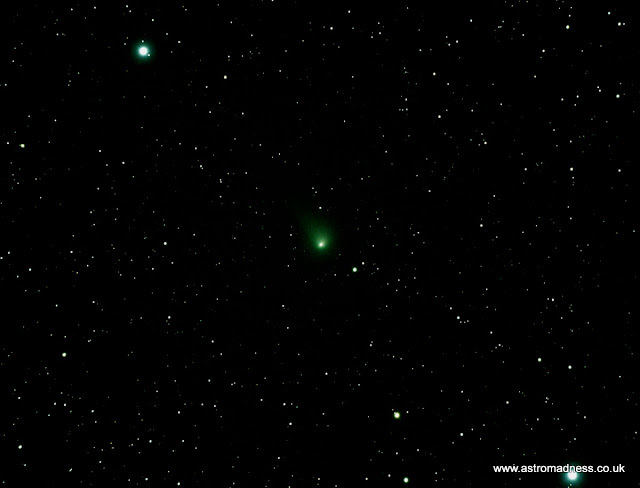 The second target for the night, and the first of the two comets was Comet 41p/tuttle-giacobini-kresák. It was making its way through the constellation of Hercules. 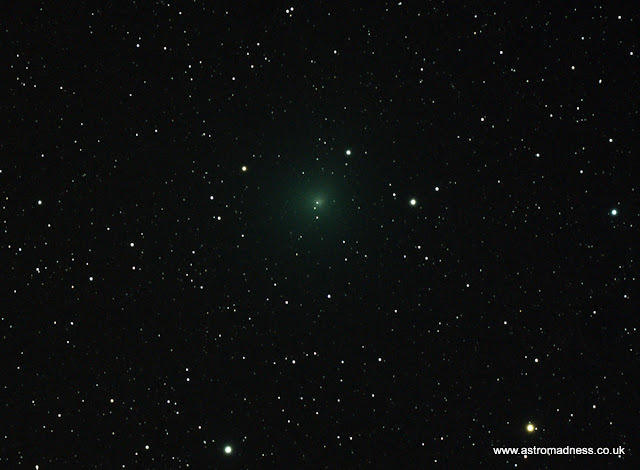 The third target to be imaged, and the second comet of the evening was comet C/2015 V2 Johnson. Again, at the time of imaging, the comet was making its way through the constellation of Hercules. 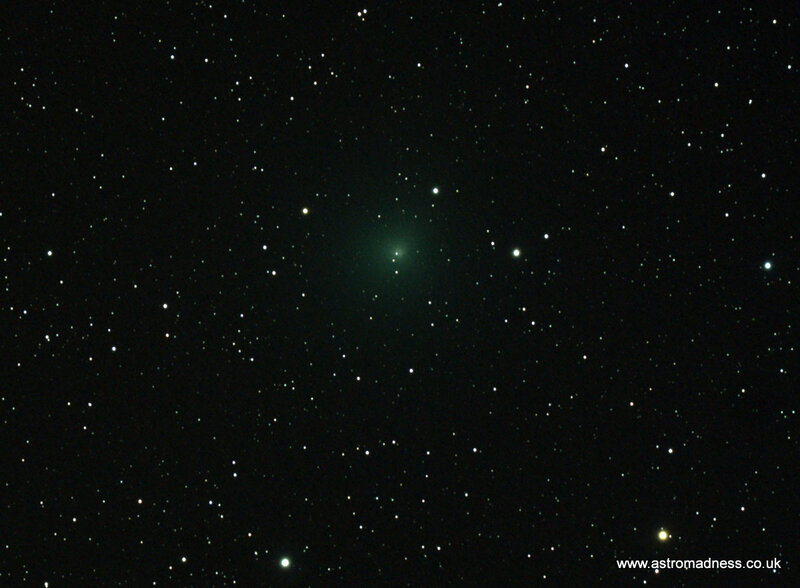 C/2015 V2 Johnson was putting on a brighter display than the previous comet, at the time displaying a single quite wide, but better defined tail. As the night went on, I could see the constellations of Cygnus and Lyra beginning their ascent up into the Spring night sky A sure time that Summer is on it's way! 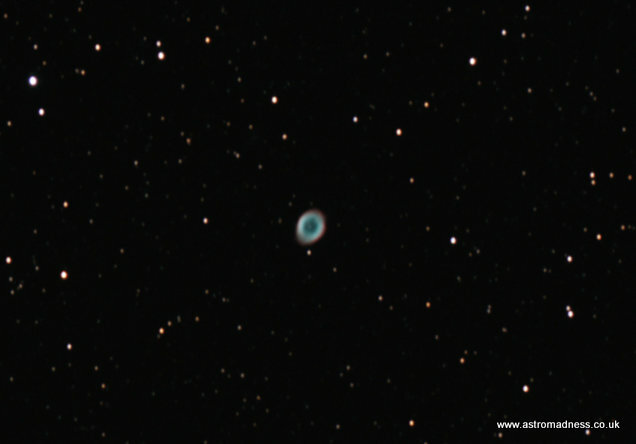 Lyra also brings on of my favourite visual targets, The Ring Nebula. It's a small target to observe and photograph, but it is very pretty and worth the effort. I have attempted to image it before, but I believe the colour is much better using a refractor rather than my previous attempts. This represented the end of my imaging session, and the end of camp for April 2017. I've learnt loads more about what I need to do to set up and get the best out of my imaging equipment without guiding. I need to pick up from where I left off with my guiding and PHD2, a steep learning curve in anyone's book. I've decided that I need to invest in a Bhatinov Mask to help with my focusing, and also a longer dovetail bar to try to move the scope further along the saddle on the mount. This should help achieve better balance. I've just come back from walking Gelert, my hound. There's nothing quite like being brought back down to Earth and normality than a dog sitting in front of you, 3 times a day reminding you of your dog owner duties. Once again, Astrocamp has given me a break from the hustle and bustle of everyday life and routine. This one has been like a holiday to me, just like all the rest of them. Yet, this camp has also been quite different. I set off for camp a day early as seems to be the normal thing for so many regular attendees and pitched up mid morning on Friday to be greeted with a big hug from my neighbour Karen, and some good friends from around the site. It's great being able to see the arrival of people and to witness camp beginning to build and get started. Over the years, I have spent nights under the stars and nights under canvass all around the globe, yet this isn't camping as I truly know it. With electric come the options of a cool box and the legendary slow cooker! Not to mention the ability to keep all the astronomy toys charged up and ready for action. With the tent and base camp all set up, it was time to settle down and let the fun begin. Friday night was a reasonably quiet affair, with cloud cover giving no opportunity to observe, it was time to pop the Farmers Arms cherry. In all the camps I have been to, I quite simply haven't had the urge to go. Friday night was different though. I could sneak in a swift half or two before tea surely? The Farmers Arms is a great little pub, but it's easy to see why Astrocamp quickly outgrew it as a location for the "astronomers in the pub" pub quiz. I believe a popular expression heard from behind the bar when things get a little bit busy is "It's f###ing chaos!" The rest of the evening was pure catch up time. Thinking about people who we knew weren't going to make it to this camp, and waiting for the arrival of the rest of the camp regulars and newbies. With my head hitting the pillow somewhere around midnight, it wasn't until around 3.30 am that some other campers quietened down enough to be able to get to sleep. With the crows starting their dawn chatter around 5.30, it didn't make for a pleasant Saturday. Confronting drunk strangers in the early hours of the morning isn't the way I wanted camp to start, so I just rode it out. It was a relief to hear the next morning that I wasn't the only one in this boat But at least the neighbours enjoyed themselves I suppose, even if they were a little inconsiderate. Somewhat jaded by tiredness, the buzz of camp started to build quite early on Saturday. The collection of telescopes started to be brought out into the broken sunshine on The Common. Released from their covers and jackets, they stood glinting in the sun, tall and proud waiting for their first use of camp. And camp HQ also sprang into life with a new look signs and camp organisers Damien, Ralph, Paul and John beginning to welcome people to Astrocamp X. One has never seen a trundle wheel used in such authority! So, to the weather. Forecasts being read out and spoken about all gave slightly different opinions. Debates on which app was better for getting the forecast correct ensued, all with the conclusion that no matter what the forecast said, nobody could influence the actual outcome. It was with these discussions going on around camp that I took my dob up to the common to join the others. It must be said that the dobsonion type telescope was very well represented this year. Usually counting only around 5 on the common, this year they seemed to be most definitely the scope of choice. In terms of actual astronomy, I wanted to keep my options open, so I had set up my 80 ED-R refractor near the tent. This is where it was to stay for the whole of camp, and where I wanted to get stuck into a bit of astrophotography. Equally, I wanted the option of switching to visual and be part of the experience of the buzz on the common. Life is all about options, whether you have an option or not, whether you take the right option from all that are presented. But sometimes, options can be a pain in the backside! You see, Saturday night was wonderfully clear well into the early hours. Great I hear you say. The problem was that I wanted to do everything. Like a child in a fairground, I wanted a go on everything, when really and truly, I should have made a call in hindsight. Stick with photography for the night, or stick with visual. Yet, I found myself trying to get the photography side of things going and then spend some time with the dob. It was only a marginal success. Yes, astrophotography did happen, but with mediocre results at best. I captured two images. 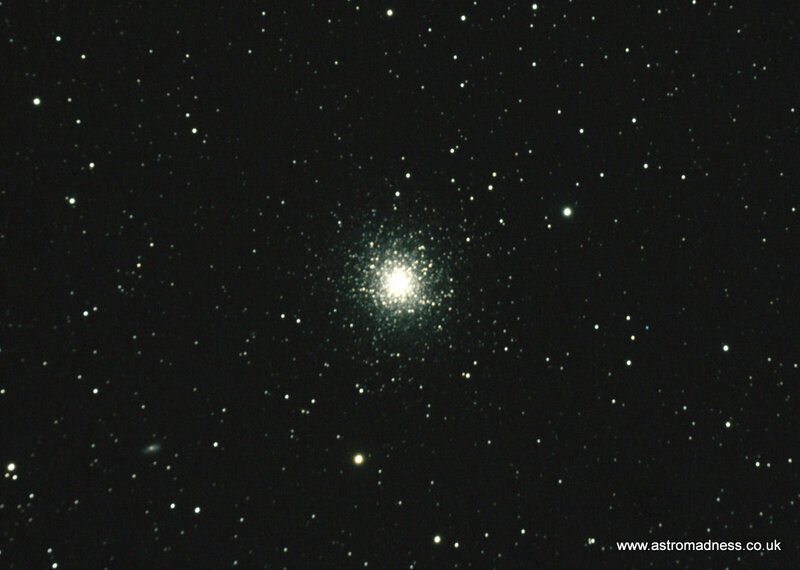 One of M 18 in Hercules and a wider field shot of the realm of the galaxies in Virgo. Also, visual astronomy did happen, but the list of targets observed was somewhat limited due to lack of preparation and time at the eyepiece. On the positive side though, some new targets observed in Virgo have helped me a step further towards ticking off all the Messier objects that I have left to see. Sunday morning. Solar SUNday as it is designated on the agenda. An opportunity to collectively break out the white light filters, the HA filters or the solar scopes. It's an aspect of astronomy that you can undertake in broad daylight providing the sun is out. It goes without saying that you should only practise it with the correct specialist equipment. You can never put a price on your eyesight. The Spiral Arms is the location of the much adored pub quiz and talks. This year Paul took the helm with a prepared talk on aliens. Well, that's not exactly true. It was a thought provoking talk on the possibility of aliens. This is a huge branch of science and free thinking that forms entire careers for scientists and academics the world over. So, to tackle it in a talk lasting less than an hour is an impossible task. But what Paul did do was to put some points forwards that got me thinking. Starting with the creation of the universe, the timescales required to create the necessary heavy elements which go on to form life was part of the talk. Then looking at things that could happen and have happened since time began in the form of filter events which could wipe out life in the universe. Black holes, asteroid and comet impact even nuclear annihilation. Paul then went onto what is possibly my favourite equation. The drake equation. I know, it's a bit geeky to have a favourite equation, but I find it fascinating. Just don't end up with a result of less than 1! Learning from the previous evenings mistake, I made the call fairly early on to stick to using the 80 ED-R for the whole evening. So, as darkness approached and the buzz on the common started to build once again, I settled down in front of the laptop to give this imaging thing another go. Results to come in a different post! Monday morning. At last, A good nights sleep with some quality time under the stars and no other disturbances! A seasoned astrocamper will always tell you that ear plugs are essential for a sensible wake up time, not being woken at the will of the local corvid population. Rain. That was the sound that greeted me when the ear plugs came out Monday morning. So far, we had 2 out of 2 good observable nights. Would there be a third? The forecast and all the apps said it would be. Alas though, as camp began to awaken to the new morning, more and more people started about their business of emptying tents and packing up. I'm afraid to say that I was also one of those. With the prospect of a 3rd good observable night, but with tiredness increasing, the possibility of observing for night 3 from the comfort of my own home was too great. So, it was with apprehension that I decided to call it a day, bringing to an end my Astrocamp X. A walk around the site showed that many pitches had already been vacated, so as I did my rounds saying farewell to my fellow campers my thoughts moved onto the journey home. A common theme in my experiences at the end of camp is the feeling and process of change and adjustment back to everyday life. A feeling that can take a couple of days to pass completely. My thanks once again have to go out to the organisers of this event, Paul, Ralph, John and Damien. It's a big undertaking, to organise and run this event twice a year. During the last day, as more and more people have expressed their thanks on social media, a theme has emerged. Comments such as 'the best camp yet' and 'the best star party I have been to' have been passed. It really does say it all. Though my camp was over in Cwmdu, I still joined my Astrocamp friends in observing for the third out of 3 nights, albeit from my home back garden. It is this third night that gave the legendary and very rare Astrocamp Full House! All nights of camp were observable nights. You couldn't as for much more from mother nature when it comes to weather! A request to the authorities in Wales. Wales. The place of my birth and upbringing. Some of the best scenery found anywhere on the planet can be found in Wales. People come from around the globe to visit Wales. They come and use the beaches, climb the mountains, sail the lakes and paddle down the rivers. Over the years with the decline in certain industries, Wales has turned to tourism and attracting visitors to it's little corner of the UK. Tourism is a huge part of the welsh economy. Wales needs tourism of all sorts. From activity holidays for children to family staycations to attracting international visitors from Europe and beyond. In recent years, another natural resource of Wales has started being tapped into. It's dark sky attracts people from all over the world to observe and image. Astronomy as a hobby is now more accessible than ever before. It is more affordable and uptake is increasing. Wales is in competition with other dark sky areas around the UK. From the moors of Devon to the remote forests of Galloway, stargazers travel far and wide to get access to the most pristine skies the UK has to offer. On the run up to the recent stargazing event, Astrocamp, held in the small village of Cwmdu, it emerged that recent lighting changes have taken place along the trunk road in the area, swapping out the old sodium style lighting in favour on more modern LED lights. This isn't the only part of the dark sky park that has had these changes. Indeed through Wales, towns, cities and villages have been making the change, all with the idea of saving money and energy. This is a very admirable reason, and one that has little opposition. But the manner in which it is being done is bringing this brilliant natural resource under threat. To role out these initiatives without something as simple as consultation of the national park or the local residents and businesses is regrettable. The government of Wales, it's councils and authorities need to understand the impact of such changes, running the risk of obliterating this fantastic resource and having the highly acclaimed dark sky status at risk of being revoked. The knock on effects can be substantial for a small economy that could be exploiting this resource and becoming a country wide if not European wide centre of importance. The deployment of this lighting, the brightness, positioning or even requirement in the first instance should all be considered before its installation. Please talk to the residence, the national parks, the dark sky organisations that fight so hard to do their best for Wales. There are ways in which outcomes can be reached to suit the requirements of all parties. From reducing the height of the lampposts carrying the lights, reducing the number of lights needed, to using dimmer lights or switching them off during the quietest time of night. There are people willing to work with you on this, not against you. During my journey of dipping my toe into the dark arts of Astrophotography, I have pulled information from all different places in an effort to try to get everything working. Some of it has been trial and error and some of it has been taken from different forums and manufacturers. This post will bring what I've learnt and what I used into a central list to try to help anyone who might find themselves in a similar scenario. This is a list of the software and drivers that I downloaded and installed in this order. There was a bit of trial and error involved, and where needs be, I've noted any significant options or settings that I needed to apply. Plug in added to allow Stellarium to talk to the AVX mount and slew to the required targets. Laptop is connected to the hand controller of the AVX machine via the supplied COM cable. I don't have a COM port on my laptop, so bought a COM to USB converter cable which does the trick. Backyard EOS for Canon DSLR Cameras. DSLR connects via 5 meter USB cable to the laptop. BEFORE attaching the Altair GPCAM Mono to the laptop, download the Windows drivers from the Altair website, along with the ASCOM drivers. Install the GPCAM Mono Windows drivers and then plug in the USB lead to connect the camera. Unzip the ASCOM driver for the GPCAM. Locate the altaircam.dll file and copy it. Download PHD2 from the Altair website. This is specifically configured to include support for the GPCAM Mono. PHD2 is a 32 bit application, but it will install and run on a 64 bit environment. PHD2 will now detect the GPCAM Mono. From what I can work out, this bundle contains the required drivers to support guiding. These are the additional files required to get the laptop to talk to the AVX Mount. Connect the mount's hand controller to the laptop using the COM cable and COM to USB converter, to the laptop. Make sure the GPCAM USB cable is connected. Note: I have tried a longer USB cable to connect the laptop to the GPCAM, but the connection isn't reliable. Using the shorter supplied USB cable gives a much more reliable connection. Connect the GPCAM to the Guiding port on the AVX mount using the supplied ST4 cable that come with the GPCAM. Launch PHD2 and start the New Profile Wizzard. In the list, you should find Altair Astro Camera ASCOM Driver. Click Detect and Next. To get around this, in PHD2, I clicked on the Mount Setup button and stipulated the COM port being used to communicate with the hand controller. As mentioned, this was actually a USB port as I had used the USB to COM port adapter. Download and Install SharpCap 2.9 software initially for it's Polar Alignment abilities. Once I set all the equipment up and had everything talking to each other, I did a dry run of trying to get everything to work together, Backyard EOS continued to work as it had done originally. I could see the GPCAM using the SharpCap software. I could also talk to the mount and GPCAM via PHD2. I was also issue slewing commands from the laptop to nudge the mount around. However, I came across my second issue when I tried to connect Stellarium to the mount with the intention of being able to select a target in the program, and have the mount slew to the target, It became apparent that I could not slew the telescope from Stellarium and have PHD2 guiding operating at the same time. While I could get around the problem by making sure the target was acquired before opening PHD2, it wouldn't be ideal. After reading up, I found that others had encountered the same issue. The suggested fix was to download and install another small piece of software called StellariumScope. It's designed to work with Stellarium, but allow commands to be sent to the mount by both PHD2 and Stellarium. Unfortunately, I couldn't get it to work. Set up and run an imaging run from Backyard EOS and my DSLR while guiding too. I hope this gives sufficient information to people on how I got everything working. I get the impression that there are many ways to skin this cat, but this is the method I used to achieve what I wanted, for the equipment that I have.